Just a few ok, thirteen wishes on my Christmas list this year. Can a girl really have too many accessories? Ok, don't answer that. I adore the planner and iPhone case. As soon as I graduate and find a job, I am going to invest in that Kate Spade planner, since my Lilly one ends soon! love the kate spade watch, classy & adorable! That little heart ring is amazing. Love the ring! The Kate Spade gloves are actually at Nordstrom Rack right now and marked down! Great pics! Thats all I need, to have more ideas for my ever growing wish list lol! I adore those J Crew earrings -- now on my wishlist! I love my Etta's in gold and I really really want the leopard print pair! Oh, I'll answer that. A girl can have triple the list of accessories, haha! Love your picks! I have the sunnies - definitely a LOVE!! Also adore the watch!! Cute picks! Loving that Kate Spade watch and the Ray-Bans! Wow! Great choices....think I love them all. Oh my goodness I will happily take one of each! 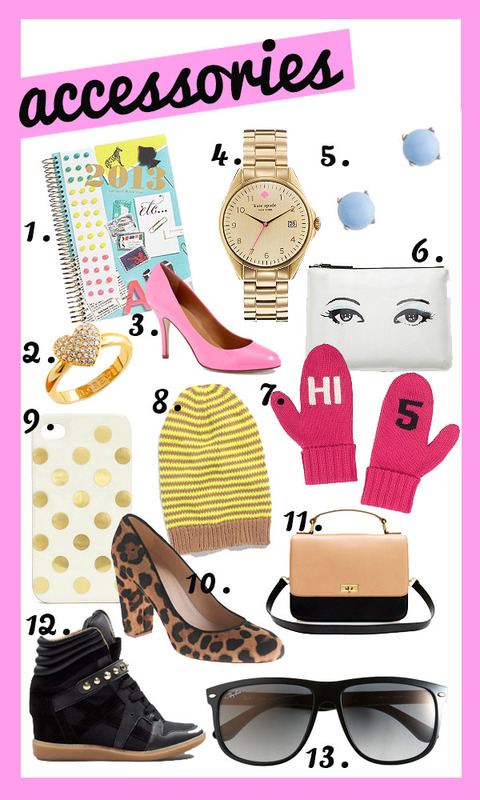 So many cute picks, can never resist Kate Spade goodies! I don't think you can ever have too many accessories! I adore all of these choices - especially the pink pumps...gorgeous! Love the make up bag with the eyes. Adorable! love the kate spade watch and jcrew heels! Check out my Gift Guides For Her, For Him and my wishlist? love the kate spade stuff! great picks! Love the planner! Oh my gosh, it's so 80s. I want it! That Kate Spade watch is on my wish list as well. So gorgeous!